Unlike their last two ‘Blur’ football boots, Under Armour are definitely throwing some serious clout behind the new Blur Carbon III. Showing that their lightweight cleats are here to stay, the Baltimore brand have unveiled a leather version to go toe-to-toe with some of the biggest names in the cleat market. The Under Armour Blur Carbon III Leather is definitely a welcome innovate from the baselayer giants as one of our main concerns with the launch version we featured at the end of last year was how frictionless the upper looked. 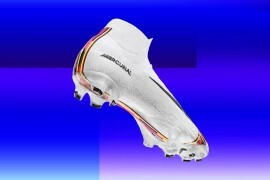 But by employing K-Leather as other brands are beginning to phase it out, Under Armour will be hoping their top-level cleat will be able to steal some ground amongst the big players in the speed game at the moment. Keeping it simple from the off, the Blur Carbon III Leather will launch in two colourways; Black / Silver / White and White / Silver / Black – striking what we feel is a nice balance between the inherently-futuristic design of the boot, and a more understated colourway. Whilst not originally enamoured with the design of the synthetic Blur Carbon III Leather, we have to admit, the K-leather upper coupled with two clean colourways certainly has us rethinking our stance on the boot. Designed by Under Armour to be ‘The Future of the Game’ – the Blur Carbon III is heavily invested in speed, support and stability. Using Carbon Fibre in a way that we’ve never seen on a boot before, the 198g boot boasts a carbon ‘wing’ on the lateral side of the boot, to help support the boot when cutting inside – because we all know that speed isn’t just about going in a straight line. As for the synthetic Blur Carbon III, Under Armour have something new in that department, too – but if you want to see more than a teaser, you’ll have to head over to our Google+ page!